Am I a cute puppy!? Pitbull puppies are the cutest little dogs anyone can own. However, before pit bull puppies can become good companions, pet owners have to make sure that they know all the characteristics regarding these dogs. Commonly known as America’s Dog, Pitbulls are popular because of their strength as well as loyalty to their owners. Pitbull puppies are energetic, trainable and aggressive at the same time. Owners should make sure that they start their training early on so that the puppies learn good behavior and owners do not have to face problems later on. Most pitbull owners feed their puppies three times a day. You have to keep in mind that because Pitbulls are active and muscular animals, they need adequate nutrition and at the same time, you have to be careful and not overfeed them. 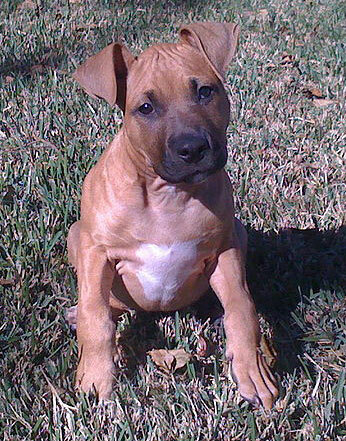 Pet owners need to take special care of the vaccinations schedule of their pitbull puppies. Fix an appointment with a veterinarian as soon as you get a puppy home is that you can get a physical check up done and collect information about the immunizations necessary. Some of the necessary shots for pitbull puppies include that for Distemper, Hepatitis, Para influenza and Parvo, called DHPP combo shot. The immunization for pitbull puppies starts from the time they are three to four weeks old and continue until they are about 20 weeks old. One of the things that veterinarians check for in young pitbull puppies is for the presence of roundworms that they can get from their mother or from different foods. Another cause for concern is the presence of heartworm and flea and tick infestation. Worms can be treated by taking regular pills prescribed by the veterinarian. Fleas and ticks can also be easily removed so that it reduces the discomfort experience by these dogs. Fleas and ticks are also responsible for causing other diseases and another reason that you should take your pitbull puppies to the veterinarian regularly. Pitbull puppies need plenty of exercise because of their energetic and muscular body. Owners should get rubber toys for the puppies that can stand wear and tear is a good purchase for these pups. Entertaining these pups with innovative toys like an empty bottle with a can inside or a set of boxes is a good way to keep these pups engaged and excited, since this breed is an intelligent one, owners should invest in toys that stimulate their mind as well as get good amount of exercise for them. Pit bull puppies should be trained as early as possible. Owners should start obedience training when the puppy is about eight weeks old. The advantage of starting the training process early is that the more consistent and repetitive the training it, the more likely it is to be successful. There are training classes that you could enroll in to get professional help while training your pet. Alternatively, you can read some of the good books like “The complete guide about Pitbulls” and find out the best way to train your pitbull puppies. Do you like puppies or know anything else what’s importent for Pitbull puppies? Tell us, leave a comment! I love this blog. Actually I have toyed with the idea of trying to commence one just like this too, however I am not sure how to do it. Tell me about this “blogging” all about? Is it difficult? Is it necessary to be an expert in computers to have a blog? I want to hammer together a simple blog for my learn english writing free website. Can the features be added seamlessly into a current website? Very, very good article. I have never heard of the book, but it sounds pretty interesting. Very helpful post. Thanks. I love this blog. For a while, I challenged myself trying to start one just like this as well, however I am not sure how to do it. Tell me about this “WordPress” portal? Is it hard? Is it necessary to be savvy in computers to make a blog? I plan to design a similar blog for my learn english writing writing website. Can it be placed into a present website?